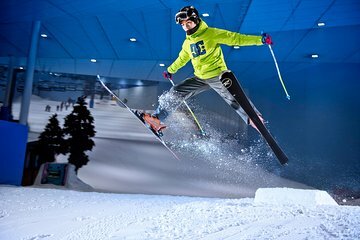 Make your own way to Ski Dubai, the indoor ski complex in Dubai’s Mall of Emirates. This huge, state-of-the-art center consists of exciting ski slopes and runs, as well as chairlifts and a snowboarding zone. Head inside with your ticket, put on your provided thermal jacket, pants, boots and socks; collect your supplied skis and poles, or a snowboard, and enter the impressive, snow-filled center. Then, feel the chill — the temperature is kept at around 30 degrees Fahrenheit (minus one degree Celsius) — and admire the artificial slopes and runs before you. If you wish, get instruction from one of the expert ski or snowboard instructors and whenever you feel ready, take to the slopes. Choose from the five different beginner, intermediate and advanced slopes that reach a maximum of 1, 300 feet (400 meters) in height. Ride a chairlift up and then tackle your chosen runs, skiing back down through the soft snow. Alternatively, if you’re snowboarding, enjoy the fantastic snowboard run and test your skills on the challenging jumps and rails of the fun Freestyle zone. After two hours, take your leave and end your experience when you exit Ski Dubai. Please note: Minimal skiing experience required to qualify as a beginner. Very good, efficient staff. They provide the entire equipment but it is correct -we read it before from a blog - that you should bring your own gloves ! Ski tracks are short, temperature -4C is ideal. I booked for my two sons a ski experience but they could not do that as the ticket receptionists stated that they needed to be expert skiers. OK, we were asked to pay an extra amount for them to go for ski lessons and later stick around the ski area if need be for the rest of the day. Sounds great? Not quite. The lessons were superb but it was short lived and within minutes my sons came out as there was nothing really to do. Walking around the ski area doing nothing else did sound like fun. They thought the Penguin watch would have been a better added package. Hindsight, right? But you'd think the reception staff are expertly trained to offer product advice depending on the customer profile age, experience etc. Overall, a great location/facilities but staff ought to better trained. This was my first time skiing and I loved it. I validated by booking and the helpful staff fitted me out with gloves, boots, skis and thermals word to the wise, bring a hat and scarf. An enthusiastic chap called Benjamin arrived, began the tutorial and escorted us through to the main complex, which is very impressive and huge. Once on the training slopes Benjamin continued our training, giving us very clear instructions on the basics. I must say he is an excellent tutor, balancing patience with encouragement with aplomb. Before long I was skiing... if you can call it that lol! and towards the end we were all at the very top of the training slopes skiing all the way down. I peered at the skiers and snowboarders careering down the other slopes at high speeds and couldn't help but feel they were having the most fun in the entire complex. I cant wait to get to that level. The only downside was when I initially validated my ticket, the helpful attendant asked if I had ever skied. When I said no he said I couldn't do the 2 hour slope sessions and would need to book at the ski school instead?? I explained what the Viator summary said i.e. If you wish, get instruction from one of the expert ski or snowboard instructors and whenever you feel ready, take to the slopes. Choose from the five different beginner, intermediate and advanced slopes.... He further suggested I should seek a refund from Viator, which I will. This was really disappointing as the beginners lesson lasted just an hour and as it was so much fun, it only reconfirmed why I had booked 2 hours in the first place. Despite this, I would still highly recommend Ski Dubai and will definitely come back. Loved, loved this experience, I have never seen snow before coming from Perth we don't have snow nor have I ever snow skied before, our instructor was great, I actually told the instructor I didn't think I would last the hour, but guess what I did and wanted to stay longer. A MUST do when you go to Dubai. If your in Dubai you've got to do it. One of the more unique things to do there or anywhere. They supply you with everything. Nice indoor snow facility but we weren't allowed to ski not for starters apparently!!! Had to pay much extra to do other activities allowed inside. kids had fun but lousy description on website and ripoff to pay more. We thoroughly enjoyed this experience and would highly recommend doing it. There are several slopes according to your ability. Its well organised and they provide socks, trousers and jackets. We will be going back again, that's for sure. Our advice would be to take gloves and a snood with you - its -4 inside and you will need gloves and would have to buy them otherwise. We wish we took our mobile phone in with us to take some pictures as the ones on site to buy are extremely expensive. Also there is an alpine lodge at the top of the slope with warm heaters and you can buy hot choc etc - again we hadn't taken money from our locker. It really is a must do in Dubai! So much fun!! We only purchased the ski package but if you are going with children you should probably purchase tickets to all the other events they offer. They provide ski pants, coat, and socks. Bring gloves and a toboggan. Had a blast this indoor skiing was all of it Ski Dubai Awesome !! !